JOHN LENNON Imagine: The Ultimate Collection (2018 UK Super Deluxe 6-DISC [4 x CD/2 x Blu-Ray] box set. This historical, remixed and remastered 140-track collection is fully authorised by Yoko Ono Lennon who oversaw the production and creative direction. 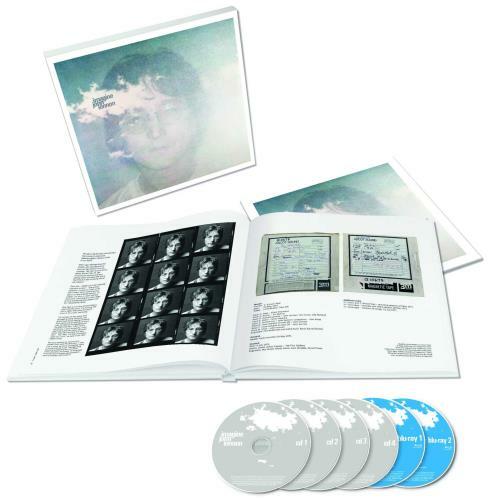 This truly unique expanded edition offers a variety of listening experiences that are at once immersive and intimate, ranging from the brand new Ultimate Mixes of the iconic album to the Raw Studio Mixes that allow listeners to hear Lennon and the Plastic Ono Band's original, unadorned performances, to enveloping 5.1 surround sound mixes, and a Quadrasonic Album Mix, presenting the original four speaker mix remastered in Quadrasonic sound for the first time in nearly fifty years. Features scores of previously unheard demos, rare outtakes and isolated track elements, also includes The Evolution Documentary, a unique track-by-track audio montage that details the journey of each song from demo to master recording. All six discs are UNPLAYED and come complete with a 120-page book within a sealed picture box. Additionally, this copy also retains its unopened original 11.5" x 10" unopened mailer box).